Whether for heating your home or cooking, oil is expensive, there’s no doubt about it. The process of making cooking oils is labor intensive and requires literally squeezing oil out of little things like olives or various seeds. And if you want a flavor infused oil? Be prepared to shell out even more money, usually for really small amounts. Luckily it’s pretty easy to make your own flavor infused oil at home! That’s it! No fancy equipment involved. Here’s what you do, plus a kind of recipe/guideline thing. The amount of garlic you use can vary based on size of cloves and how garlicky you want your oil. In a pot large enough to accommodate the amount of oil you plan on making, pour in the oil. Halve the garlic cloves and add to the oil. Heat the oil over medium heat. You don’t want it to get too hot, you’re not deep frying the garlic, just heating it enough to allow the allicin and whatnot in the garlic to infuse into the oil. Keep this mixture warm (if you start hearing bubbling/sizzling, turn down the heat), stirring occasionally for 15-20 minutes. Turn off the heat, and allow to cool. Strain out the garlic cloves. Pour the oil into a jar. If desired, you can place a garlic clove in the jar as well. It probably won’t add much extra flavor, but it’ll look fancy. 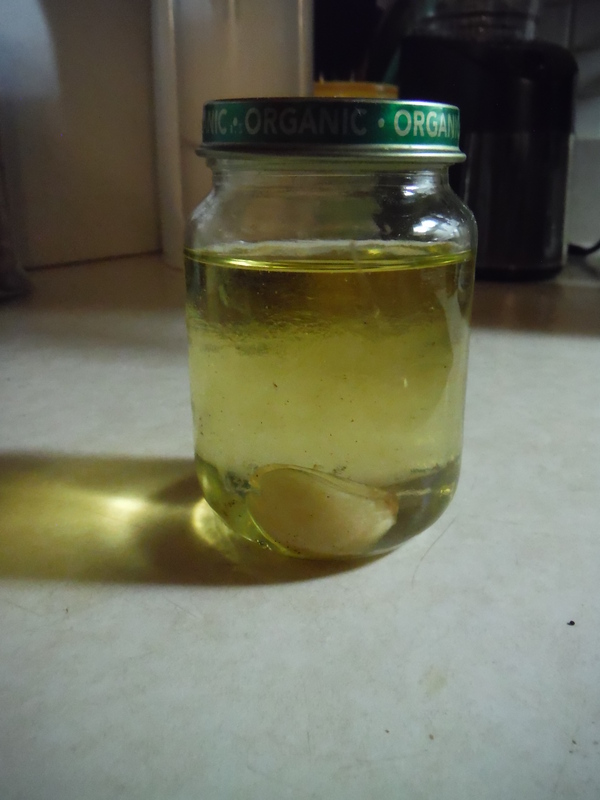 Kept in a tightly sealed jar your garlic oil will keep for 2-4 weeks. If it loses its garlic smell, or starts to smell bad, don’t use it. There you go, now you have your own garlic infused oil. You can dip bread in it, or even use it to make popcorn. Anything you want to add a nice subtle garlic flavor to. Posted on October 9, 2014, in Cheat Codes and tagged easy, garlic, gluten-free, knowledge is power, recipes, smells. Bookmark the permalink. 1 Comment.